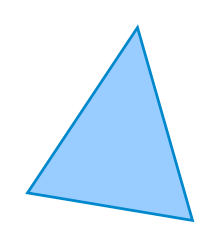 ↑ Weisstein, Eric W., "Equilateral Triangle", MathWorld. ↑ "Solving Triangles". Maths is Fun. Retrieved 15 June 2018. ↑ "Solving Triangles". web.horacemann.org. Archived from the original on 7 January 2014. Retrieved 15 June 2018.